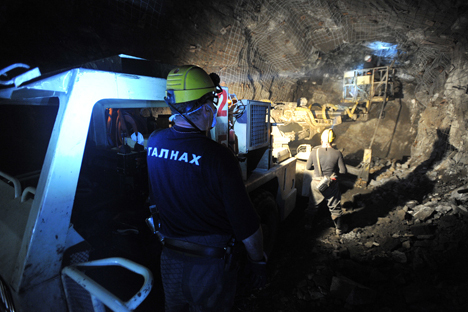 The areas around the Ural Mountains will be at the forefront of production using new technology to extract rare earth metals from uranium ore. Scientists expect the project to help Russia return to the market that has been dominated by China. Scientists from the Ural Federal University have developed a unique technology to extract rare earth metals from uranium ore. Their scientific acumen lies in the creation of a sorbent that makes the extraction possible. Pilot production will be set up using this technology in the near future. According to the scientists, this will slash the Russian market’s need for rare earth metals by a third, reduce the dependence of many industrial sectors on imports and put pressure on China, which has a monopoly on the world rare earth metals market. Currently, 97 percent of all rare earth metals supplies are controlled by China, which often takes advantage of its monopoly by manipulating prices. Of the 120,000 tons of rare earth metals produced every year, Russia churns out a mere 100 of them, even though the Soviet Union was once one of the world’s leaders in this sector. Russia’s new technology will help boost output by an additional 100 tons within a few years. In the next three years scientists need to create a formula for pilot production of rare earth metals using a unique uranium-leaching technology. To promote this development, the government will allocate 300 million rubles ($7.8 million) to the university and another 360 million rubles ($9.3 million) will be financed by Moscow-based company CJSC Energy Projects, the university’s partner. What exactly does this technology entail? Sulfuric acid is pumped underground, which dissolves uranium and rare earth. The resulting concentrate is removed and valuable components are extracted from it using a special processing complex. The technology is revolutionary in that it utilizes a sorbent that selectively extracts uranium, rare earth metals and scandium from solutions without influencing uranium production. Scientists at Ural Federal University managed to synthesize this sorbent in conjunction with their partners.